This is a favorite story to write year after year. It’s a great way to look back at all that happened, contemplate what we could have done better and use it as a basis for the coming year. 2015 was a good year overall. Many things went well both here at media central and out on the road. For starters, it was our 16th anniversary. Does this mean we can finally operate a motorcycle on the road legally? Let’s hope so. In January, Derek went to work on overhauling our online store and moving it to a new platform. One that plays better with mobile. Once we got the look and feel where we liked it, we set out on the arduous task of hand-keying 800 skews into the system. Oh what fun. 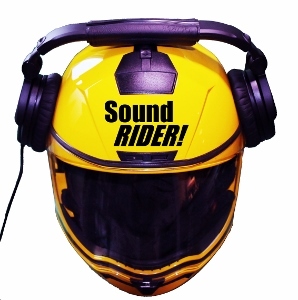 I’m not sure if you know this, but without the store there would be no Sound RIDER! While advertising revenues exist, they’re not enough to pay all the bills. The store makes it possible to get all the bills paid, so when you buy something from us, you’re a part of our existence. And we thank you for that. Typically, I do a number of seminars during the winter at various stores, but almost annually at BMW Motorcycles of Seattle. I wanted to do something different this year. Instead of a slide show or PowerPoint presentation, I wanted to do something that would benefit everyone in the room. I’d been producing a series of columns for American Motorcyclist magazine on Touring Tips and Tricks and decided to take that into a seminar format. No projector, no P.A. and no agenda. The agenda would come from members of the audience themselves who would ask to discuss a particular aspect of touring. I’d respond with my experience and open the floor to the others in the room to chime in with their two cents. The format worked splendidly and everyone got some good info from the event. I repeated the seminar format at several other dealers and was later invited by the BMW Owners Association to present it to a packed house during the National Rally this summer. Fun stuff. I can’t wait to do more in 2016. If you have a club or group you’d like me to present to, email tom@soundrider.com. In 2014 it occurred to me that radio was dead – at least in my world. There were no talk shows I was interested in and all my favorite music stations had been yanked. Call me Grandpa, but there was just nothing of interest for me on the radio. So I started tuning into podcasts. Podcasts are cool because you can seek out shows that interest you. So I sought out motorcycle podcasts. The deal is that while there are a lot to listen to, many are amateur hours with two or three guys babbling about bikes and little substance otherwise. I thought it might be fun to try one of our own, but spice it up with some local celebrities and insert local riders' favorite places to ride. Really make it a truly Pacific Northwest broadcast about motorcycling. In my days before Sound RIDER!, I spent 25 years in the music business and owned and operated a recording studio for more than 15 years during that era. In January I gave myself a budget to get some decent gear, and Derek and I proceeded to pull together a pilot show. You don’t ever want to hear it, but it was a chance to get our feet wet, learn from our mistakes and move forward to an official production in February. 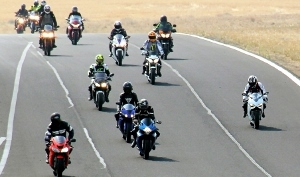 We had a number of guests on that first show including Tad and Gaila from the local moto B&B hub of MotoStays.com and Dan and Eric, the co prez’s of the WA State BMW club. Not bad for our first official show. We’ve produced one every month since then and the shows seem to get better and better as we get more relaxed and comfortable in our delivery each month. We’ll stick with the monthly format. I don’t think there’s enough out there to go to a weekly format. I’d rather make one dynamite show each month, than four so-so ones. In March we shipped the location packages for the 2015 Café to Cafe Grand Tour. It was the best response ever with nearly 100 people paying to sign up for the competition. Our bonus location went DOA the same week we launched, but that was ok as we let riders know they could sub any location in that town (Harrison Hot Springs, BC). A hundred riders out touring the Pacific Northwest and hitting some tasty restaurants along the way. That’ what road touring is all about and It feels good to know folks are having a good time riding and eating throughout the better riding months. Of course we’re doing it again this year! The major search engines made it clear this would be the year that websites that didn’t morph into mobile would be sent to the back of the line. Seriously, with so many people accessing the web via their phones, I can’t blame anyone for putting their foot down on this issue, but of course we had to conform too. We tried several different ways around it, but when the site would render in full mobile on an iPad, what good would that do, so it was back to the drawing board. Derek was of the mind to move the entire site to WordPress and call it a day. I knew all about the vulnerabilities of WP and didn’t want our data behind a cheap cookie-cutter facade that was well known for being vulnerable. Instead I got some education on how to do this myself on the ASP.NET platform we were already on. Then I put on my propeller hat, grabbed a beer and wrote the code single-handedly – in about 7 hours. The design wasn’t perfect, but it worked and as the months go by we make minor tweaks here and there to move it along. We’ll continue that in 2016. Yeah – time to ride again! We had a crew of about 20 all set to meet up in Astoria, OR, in July and hit the forest back roads to explore the Oregon Coastal Ranges. Getting out and riding with a few old friends, and making some new ones, too. A great way to travel. Donn and Deb Harvey returned for another helping of Sasquatch, Oregon Coastal Range style. It was great to get to ride with them again. The route just got better and better with each day and the Friday afternoon haul from California back into Oregon over an old wagon trail was certainly the highlight for me. And then it rained. It had been a long time since we’d seen any rain. We needed it and riding in it was joyous, not a hassle. The humidity got so dense, my carbureted bike began to choke on the road up to the Oregon Caves. 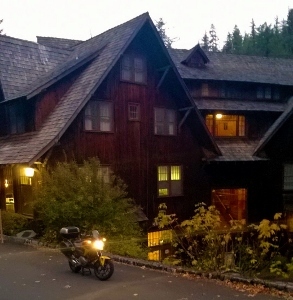 I relaxed on the throttle, babied it along and arrived in Grants Pass just 6 minutes late for dinner. Our 2016 Sasquatch tour will take riders along the Columbia River from its delta to its head waters. If you own a dual sport bike, you won’t want to miss this. Every rally is different. As large as the fairgrounds are in Billings, MT, there was concern they could not accommodate everyone who wanted to camp. I think I know why. 10 years ago a rider would appear with a 2-man tent and there would be room for all. Nowadays these large Redverz tents and their competitor’s set-up with the footprint of a six-man tent. Well, that’ll put a dent in your available camping inventory. It all got worked out, the rally went off pretty smooth, and Connie and I are happy we took the time to make the trip out (2 days each way). The support from the riders made it all worth our time and effort. From 5,000 attendees in Billings to 300 in Hood River. The other difference is now I’m running the event along with one of the best event crews anyone could ever hope for. Bruce, Gary, Connie, Paul, Derek, Pete, Jesse, Brandi and the folks from Fast Lane all did a stellar job. I was happy that the rally had a better turn out than 2014 and all indicators say it will grow again in 2016. We love that. In late September I did some scouting. What a great area. After 14 years of scouting the Gorge, I’m still stumbling into new roads that we’ll introduce attendees to in 2016. For the 2015 Road Trip Tour, the plan was to explore some of the backroads in Northern California. I personally had not been on a lot of the ones I picked out, so as a precaution I arranged to have Carl Spurgeon and Bob Reichenberg go pre-ride the route. They hit it on a Monday in July and called me that Tuesday from their hotel room in Chico, CA. ‘Too smokey to ride’ came their voices collectively over the speaker phone. Thus we never got to pre-ride the route. Hmm… I wondered how this would turn out. Day one went quite well, with the exception of a little road work. Tuesday morning was awesome. It was Tuesday afternoon’s jaunt down the paved goat trail into Lake Berryessa that sort of got the ball rolling in the wrong direction. Yea – well – you know – you gotta ride a little crap sometimes to get to the good stuff. 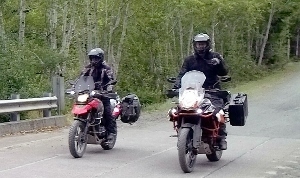 Thursday’s ride out to the coast was pretty good once we made it out of goat trail #2. The ride up PCH to the Chandelier Tree was awesome. I would not trade that moment for anything. Day 5 in the morning up to the Oregon Caves was a stunner as well and even better if you could have located the fuel stop in Happy Camp. The road back into Oregon was a good one and another magic moment of that tour. OK – so we had a few tough sections, but the core group all agreed it was well worth it. For 2016 we’re back in the PNW riding along the entirety of the Columbia River. I hope you can join us. With the Advanstar folks moving the International Motorcycle show to Portland this year, everyone had a question mark in their mind as to how it was all going to turn out. The Portland/Vancouver metro market is the second biggest market in the Pacific Northwest, but it’s only about 38% as big as the Puget Sound. Nonetheless, the show was well attended and supported by more vendors than we’ve seen at more recent Seattle shows. Connie and I enjoyed getting to spend time with local Portland riders who read this online magazine, but we don’t otherwise get to interact with. The PNW Motorcycle Exhibit, our contribution to the larger show, allowed the attendees to see more than a dozen one-of-a-kind motorcycles from around the area. We thank the contributors for sharing their bikes that weekend. As we close out the year, I look back and feel good about how things went overall. We’ll spend the winter months prepping the rally sites for 2016 and getting things ready to roll when the warmer months arrive. 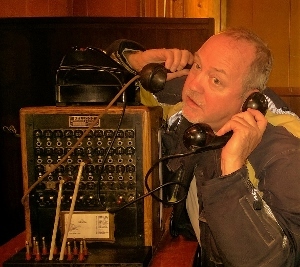 Hey - we might even think about upgrading our phone system (see photo). If you participated with us at one of our events, we appreciate you being there. To all our readers, thanks for reading. You’re some of the best riding friends we could ever have hoped for 16 years ago when we launched this venture.